We take pride in our caring and personal approach to dealing with executries, helping you through difficult times. We can help to place your assets in trust, giving you peace of mind knowing that your estate will be looked after in accordance with your wishes. When it comes to selling your property, we can assist you fully with our Estate Agency and Conveyancing solicitors. Issues regarding children may require legal assistance, our experienced team of solicitors can help you resolve these matters properly. Walker Laird can go through the necessary steps to appoint a guardian to make sure your loved ones are looked after. We have a dedicated commercial property department to service your business needs. At Walker Laird we have specialist solicitors who can offer you expert advice in all areas of Family Law. We will help create your Will and appoint executors to ensure that the terms of your Will are properly adhered to. Our solicitors will guide you through the available options to give you peace of mind for all the future may bring. Walker Laird are here to assist you throughout your entire life, helping generations for generations since 1815. Cecilia Miller, Commercial Lawyer at Walker Laird, has over 20 years experience within commercial property. Cecilia advises on the buying, selling and leasing of commercial property in addition to advising on all aspects of commercial legal work. Walker Laird has a longstanding reputation of looking after the best interests of our commercial clients by providing a high quality of service. Whether you are a local business or a national lender, we can offer a bespoke service to satisfy your commercial needs. 19 Park Road is a substantial individually built detached Villa with adjoining annex/'Granny Flat' accommodation. 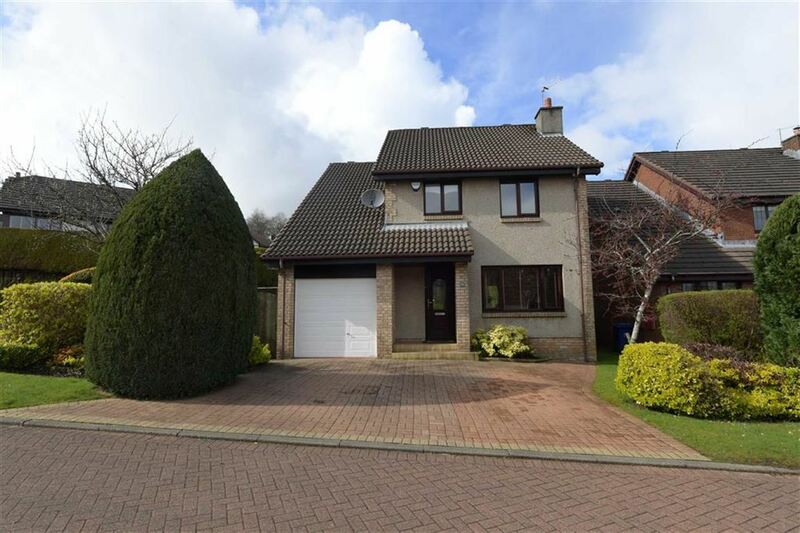 The impressive family home is located in a desirable pocket of the village of Inchinnan amongst other self build properties. The wonderfully appointed five bedroom property is formed over two levels and set within ample mature gardens. The lower level accommodation comprises: Entrance Vestibule, Hallway, generous Lounge with dual aspects, Dining Room, Dining Kitchen featuring an Aeg double oven, an induction hob and extractor, Utility Room, Study/Bedroom 4 and Cloakroom W.C. The adjoining 'Granny Flat' is accessed from the Hallway but also has a separate entrance at the front of the property. The accommodation consists of: open plan Lounge/Kitchen and a Bedroom with an En-Suite Bathroom. The upper floor of the property extends to: a spacious Master Bedroom with fitted robes and En-Suite Shower Room, a further two double Bedrooms and a luxurious four piece Family Bathroom with an extra large bath tub, shower cubicle, w.c and basin. The well presented home is positioned on a good size plot. The mature gardens surround the property with large areas laid to lawn. There is an ample mono-bloc driveway leading to a detached brick built garage. Further benefits include: gas central heating and double glazing. Park Road is ideally situated close to the village amenities including bus services, shops, the local Primary School and Nursery. Inchinnan is within easy reach of Renfrew, Paisley and Glasgow where a much wider variety of amenities are on offer. Intu Braehead is also only a short distance away, offering a wide variety of retail and leisure amenities. For the commuter the M8 Network is also on the doorstep. 24 Wrightlands Crescent represents a unique opportunity in the local market for a buyer looking for a modern detached family home with a difference. The substantial five bedroom property benefits from a two storey extension housing a swimming pool room and a wonderfully appointed master bedroom. The immaculate property enjoys open aspects from a slightly elevated position with generous landscaped gardens set in a quiet cul de sac. The lower level comprises of: Entrance Hall, Lounge, Dining Room complete with patio doors to the Conservatory, Cloakroom W.C, and a stylish modern Kitchen featuring a breakfast bar, NEFF oven, five ring gas hob and extractor. The lower level also houses a tiled Pool Room complete with a SwimEx hydrotherapy pool; a state of the art home swimming machine/resistance pool. There is also a Shower Room featuring a steam shower off the Pool Room. The upper level extends to: five good size Bedrooms and a Family Bathroom complete with a modern white suite and an electric shower. The stunning Master Bedroom features a Paris balcony and benefits from a separate Dressing Room with fitted mirror robes. The En-Suite in the Master is enhanced with a luxury freestanding tub, modern white w.c, wash hand basin and bidet. There is also an En-Suite shower room in Bedroom two. The immaculately presented property is offered to the market in excellent decorative order. The property features a range of quality floor coverings including hard wood floors in the upper landing and lounge. Further features include: gas central heating and double glazing. The generous plot at the property incorporates landscaped gardens with an ample mono-bloc driveway leading to an integral garage. The property has excellent open aspects to the front over the Kilpatrick Hills and the River Clyde. Wrightlands Crescent is positioned in a quiet pocket of Erskine within easy reach of local amenities at the nearby Bridgewater Shops. Erskine itself offers a wide variety of amenities including shops, public transport links and local schooling at both primary and secondary levels. Intu Braehead, Glasgow Airport and Glasgow City Centre are all easily accessible via the nearby M8 Network. Internal inspection is a must to fully appreciate the quality of accommodation on offer. 42 Roundhouse Circle is a stunning Detached Villa at Deanpark Gardens, a recently completed bespoke development by Stewart Milne. The impressive four bedroom family home is nestled in the corner of this attractive tree lined development. The stylish contemporary accommodation is laid out over two levels and positioned within landscaped gardens. The lower level comprises of: Hallway, generous Lounge, Cloakroom W.C, open plan Kitchen/Dining/Living area with French doors onto the rear garden. The Kitchen incorporates integrated Smeg appliances including fridge freezer, oven, microwave, gas hob and hood, as well as a breakfast bar and Utility cupboard. The upper level extends to: four well appointed Bedrooms, Master with a walk in wardrobe and En-Suite benefitting from a double shower cubicle, a Family Bathroom and En-Suite in Bedroom two. The Family Bathroom and Master En-Suite feature a range of excellent vanity furniture. There are fitted mirror wardrobes in Bedroom two. A high specification finish is evident throughout the property. The accommodation is presented in walk in condition. Further benefits include: excellent storage, gas central heating and double glazing. The mono-bloc driveway at the front leads to the integral garage. The enclosed rear is mainly laid to lawn. Renfrew town centre is within easy reach of Roundhouse Circle and there are a variety of amenities on offer including shops, banks, a post office, bars and restaurants. Local schooling is readily available both at primary and secondary levels. For the commuter the M8 Network is on the doorstep providing quick access to Glasgow City Centre, the West End, Glasgow Airport and further afield. Intu Braehead is also minutes away for a good choice of retail and leisure activities. Internal inspection is highly recommended to fully appreciate the quality of accommodation on offer. 36 Parkinch is a modern Detached Villa built by Cala Homes in this exclusive cul de sac in Erskine. The immaculate accommodation has been maintained to a high standard by the current owner and is presented to the market in walk in condition. The well appointed family home is formed over two levels with an integral garage and set within manicured gardens. The lower level comprises: welcoming Hallway, generous dual aspect Lounge/Dining Room featuring french doors, a stylish Dining Kitchen incorporating an integrated fridge freezer, five ring gas hob, oven and extractor hood. There is also a useful downstairs Cloakroom W.C. The upper level extends to: four Bedrooms, all with a variety of fitted storage, Master En-Suite and Family Bathroom which is tiled with a white suite and fitted vanity furniture. There are a range of quality modern floor coverings and fittings throughout the property. This excellent family home is presented in fresh neutral tones. The specification includes; gas central heating and double glazing. A mono-bloc driveway at front leads to the integral garage. The garage can be accessed from the hallway also. The back garden is mainly laid to lawn, but also features an area of paving. Parkinch is positioned in a quiet pocket of Erskine within easy reach of local amenities at the nearby Bridgewater Shops. Erskine itself offers a wide variety of amenities including shops, public transport links and local schooling at both primary and secondary levels. Intu Braehead, Glasgow Airport and Glasgow City Centre are all easily accessible via the nearby M8 Network. Fill in your details below to be kept up-to-date with all the news at Walker Laird - family law experts and estate agents.